The Good, The Bad, and the Chaotic Neutral: SWA: Orktoberfest! Happy Orktoberfest everyone! 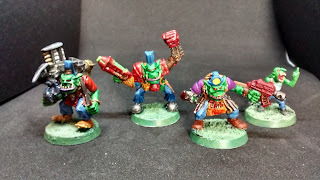 Yes, it is that time of year when the bloggosphere and on line hobby groups give way to the exuberance of the greenskins! 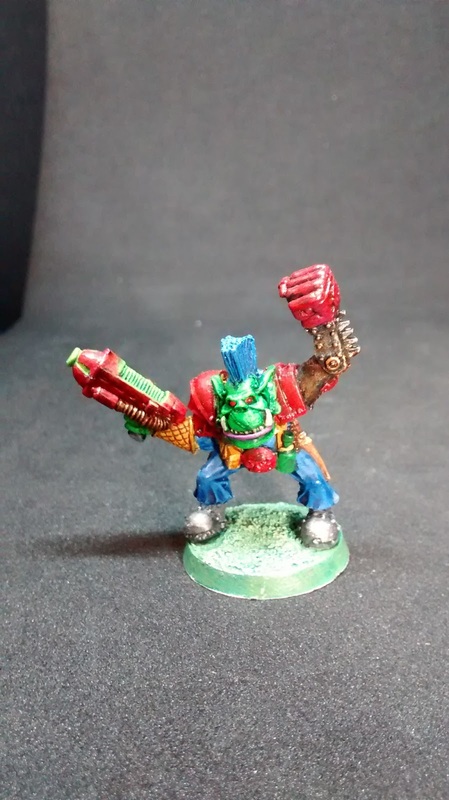 I had been planning on spacing out my various Ork/Orctober blog posts throughout the month, but a combination of work/life balance being hectic, plus lots of actual game playing!! 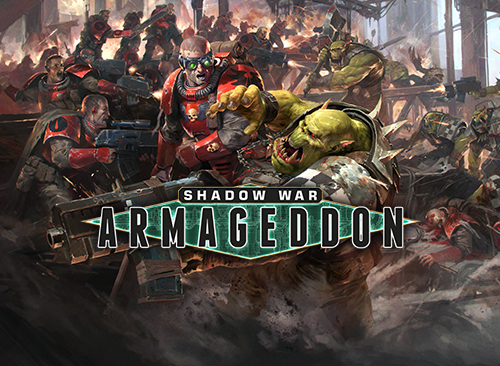 (sadly no Shadow War however), has meant that they are all going to come in a rush at the end of the month. First up has to be the next recruits to my Snake Bite kill team for SWA. 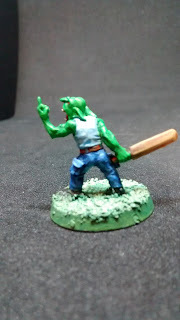 Sadly my Summer of Shadows project has not involved nearly as much gaming as I had hoped for thanks to ill health, but I have enjoyed an Indian Summer of painting up these vicious bastards. "Wot choo lookin at dog breff!?" 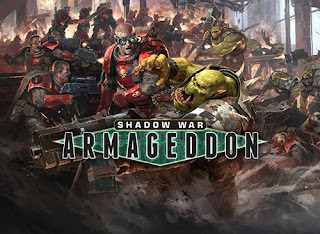 They have all been painted up using the same 'red period' colour palette as the rest of my 2nd Ed and SWA Orks, although I will admit that I ended up using more red on these than I initially intended. They are still Snake Bites. Honest guv! 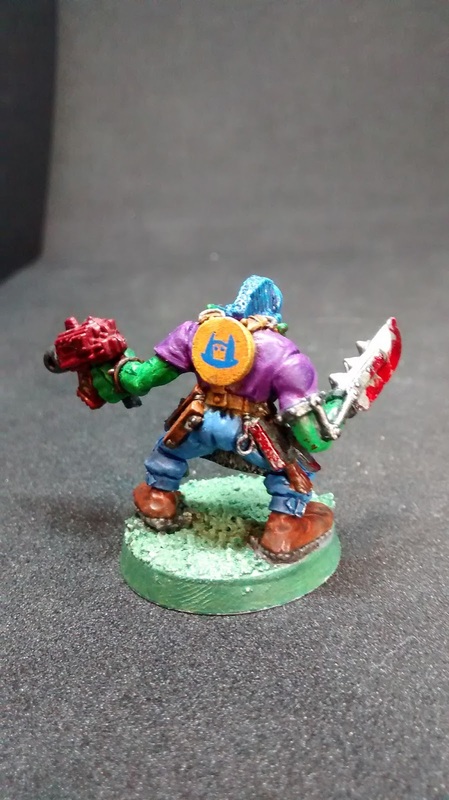 This is going to be my Mek Boy for SWA, but is actually a Nob from the back of a RT/2nd Ed era Nobz Warbike circa 1990(?) 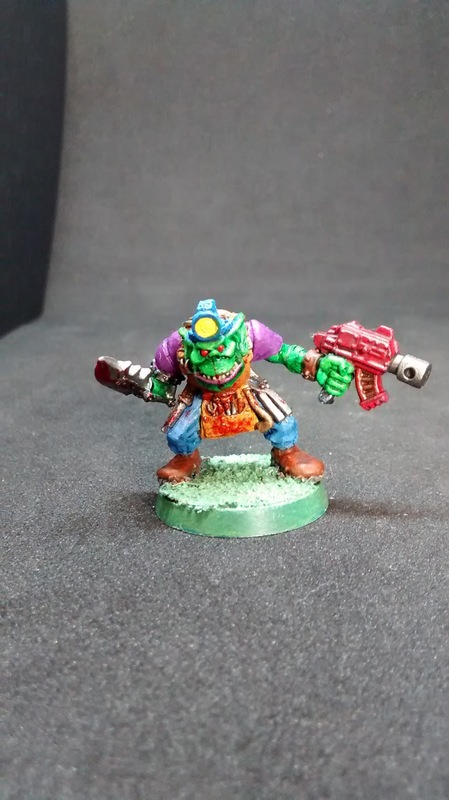 - I slightly regret choosing green for the plasma energy, and bottled any attempts at OSL (object sourced lighting) as a result, having been slightly disappointed with how it worked out on another old school Ork I painted earlier in the year. 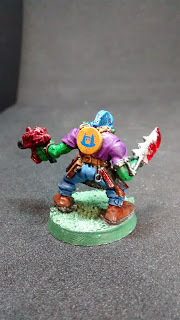 Also not that happy with the freehand clan markings on this one, it's slightly off centre and maybe not immediately recognisable as Snakebitey enough, despite being straight out of the 2nd Ed Codex. Ah well, at least it proves he is a Snakebite, despite all the red. Proves it I tells ya! This is my second Spanner Boy wiv Rokkit Launcha, and possibly my favourite of the bunch. Not only am I happier with the freehand glyph, but it includes some scavenged RTB1 Space Marine parts in true Orky fashion. I deliberately didn't repair/repaint the missile launcher (other than to tidy up some paint splatter and add a grey highlight to the black metal areas) as I wanted it to feel like he has lifted it from somewhere else. I think it does that without looking completely out of place. 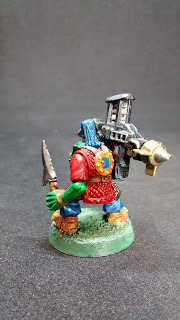 I also made a shank out of some left over pistol handle and a combat blade attachment for a Space Marine bolter. 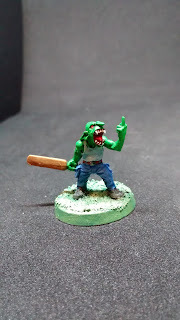 This is obviously my Pain Boy, and a very fun mini to paint. 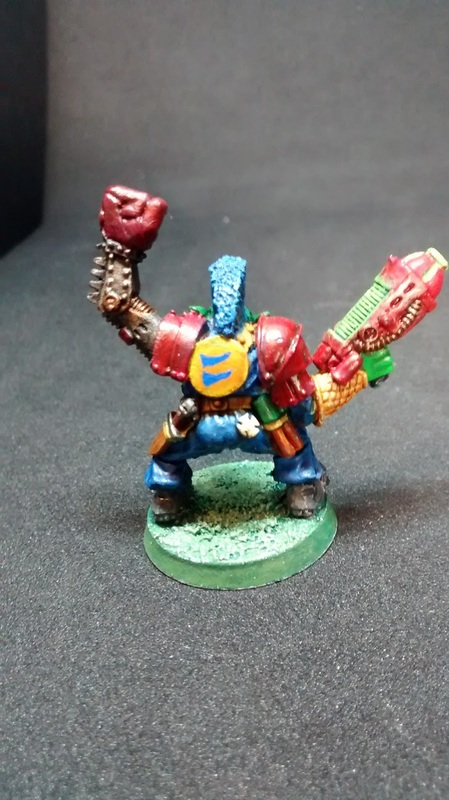 I added a later edition bolt pistol, so I could paint the heavy casing red to tie in with the rest of the band and a prosthetic blade-arm from Gorka Morka which seemed an appropriate choice. I had trouble with the splatter effect of Tamiya Clear Red up the front of his apron, but a single rogue line flicked up over his mouth and face which I like in a gross sort of way, so I quit while I was ahead. More practice required there however. Finally we have this rude little felllow! Yes, that is a cricket bat. 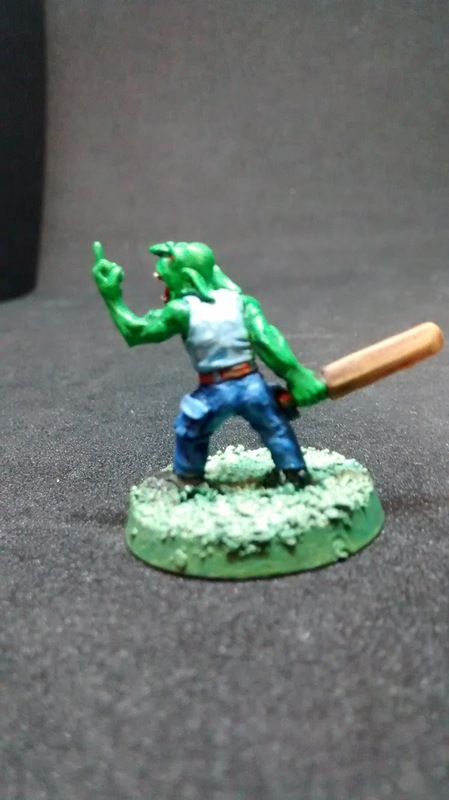 Originally sculpted by Kev White for the GoblinAid project a few years back he was a present from a fellow Old/Middlehammerer, the Goblin Bat Man (aka 'Gretchin Anaesthetist' in my universe) is going to act as the Pain Boy's assistant (active in 40k but a non combat role in SWA). The colour scheme is less red period than the others, and not just because there is hardly any red on him. 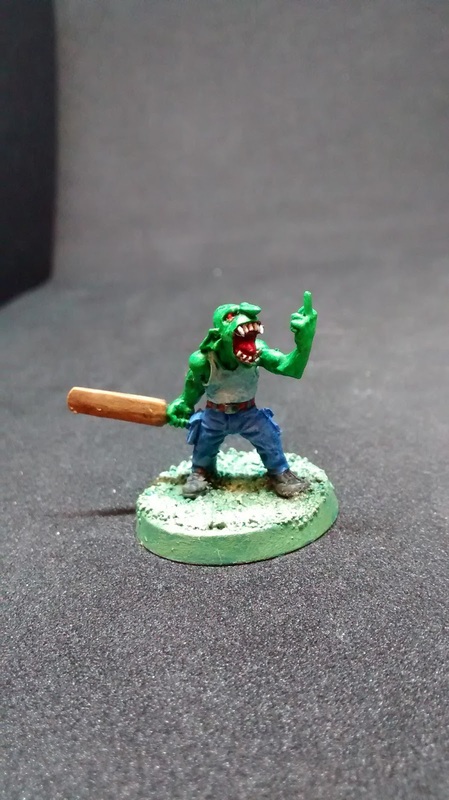 The sculpt just seemed to call out for a paint job that makes him look like a contemporary street thug. Love him! 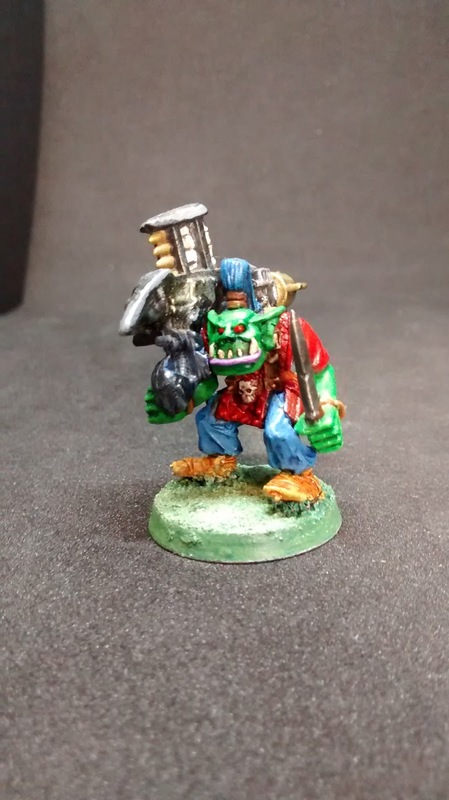 Anyway, I should be getting on with my next Orctober post! Thanks for stopping by. Do come again and bring some cake. They're a great bunch, full of that oldschool crazyness !